We are now looking around the greenhouse to spot the plants that will be the stars of the greenhouse visitors to the British Orchid Show this week. 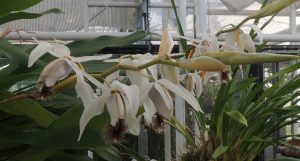 Perhaps our most dramatic plant of the moment is our monster Coelogyne Barbata with twenty spikes opening this week. 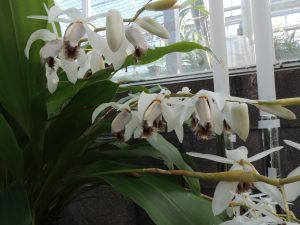 Barbata means ‘bearded’ and the bearded coelogyne is a truly spectacular thing. 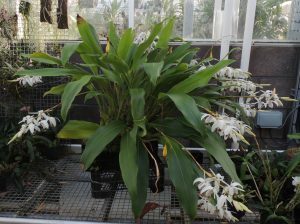 This plant has been growing in Cool Asia since 1998 and is rapidly becoming a specimen plant. This year there are eleven spikes each with about ten large flowers. The dark brown ‘beard’ on the lip is probably an evolutionary adaption to limit access to just one species of bee to increase the chances of successful cross pollination. The plant grows in a large basket and is kept wet in the summer and damp in the winter to reflect the habitat which is wet evergreen monsoon forest from Nepal to Southern China. We haven’t seen this species in Sikkim but we have visited the habitat (1000-1800m) where coelogynes are abundant. We have lots of seedlings from this plant growing well in the lab and these are the result of a cross made at the last British orchid Congress on Norwich. A congress is a great chance to set seed from the wonderful plants that come together from all of the UKs top growers. We are expecting the orchid hall to be truly spectacular.